Station Hollywood: Legendary actress Suchitra Sen was remembered on her death anniversary. Legendary actress Suchitra Sen was remembered on her death anniversary. Suchitra Sen was remembered on her death anniversary. Bengal’s Mahanayika Suchitra Sen had become immortal in her works. She had been remembered on 6th April, 2017. Suchitra Sen died on 17th January, 2014, at an age of 83 years. The entire film fraternity and her numerous lovers had become speechless to hear her death news. She was admitted in Belview Nursing Home more than 2 weeks. Chief Minister Mamta Banerjee mourned her death. 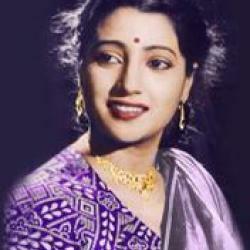 Legendary actress Suchitra Sen had been remembered on her 84th birthday on 6th April, 2014. In Star Ananda Channel veteran actress Sabitri Chatterjee had been invited to speak about Suchitra Sen. She acted with the legend in many films like Annapurnar Mondir, Grihadaha, etc. Suchitra Sen started her career with the film Saat Number Qaidi in 1953 and ended up with the film Pranay Pasha in 1978. After that she retired from film acting. Within the span of 25 years she acted in 3 films opposite Uttam Kumar making the romantic pair immortal over the last 60 years. She also acted in bollywood films including Devdas opposite Dilip Kumar, Bombai Ka Babu opposite Dev Anand, Mamta opposite Dharmender and Ashok Kumar, Aandhi opposite Sanjeev Kumar, to name a few. Suchitra Sen had a tremendous combination with singer Geeta Dutt and their understanding both in Bengali films and bollywood films had created history during the golden age, that is the 50s and 60s. In the film Indrani, all the songs sung by Geeta Dutt for Suchitra Sen including “jhanak jhanak madhur badan”, “nir choto khoti nei”, “ogo sundoro”, etc., all became super hit. Suchitra Sen provided hit films one after the other with Uttam Kumar, during that age and Indrani also falls in that category. Even in films where Geeta Dutt had sung only one song for Suchitra Sen, even in those films, the songs had a great impact in the success of the films. The song in the Ajoy Kar’s epic film Harano Sur, in 1957, titled “tumi je amar” had a unique appeal for the audience. Uttam Kumar lost his memory due to meeting with an accident and Suchitra Sen sang the song a number of times in the film. It haunted the viewers and touched the souls of numerous admirers of Bengali films. Geeta Dutt’s song for Suchitra Sen also in the film Hospital also became extremely successful. Ashok Kumar acted opposite Suchitra Sen in the film and the song was “ei shundar sharnali sondhae”. In bollywood films, SD Burman used Geeta Dutt for Suchitra Sen in the film Bombai Ka Babu. Dev Anand acted opposite Suchitra Sen in the film and all the songs were super hits. The main songs included “dekhne me bhola hai”, “pa ma ga”, etc., out of which some of them were duet songs with Mohammad Rafi and their romantic by every musical standard. As Suchitra Sen made memorable contribution in bollywood films for more than 30 years, a lot of legendary singers contributed for her during that period. There were hit songs sung by Sandhya Mukherjee in landmark films like Sagarika, Pathe Holo Deri, Sriti Tuku Thak, Uttar Falguni, Bipasha, etc. At the same time in bollywood films Lata had sung landmark songs for Suchitra Sen including “rahe na rahe hum” composed by Roshan in the film Mamta, “is mor se jate hai”, “tere bina zindagi me shikwa” composed by RD Burman in the film Aandhi. Even then Geeta Dutt was probably the only singer who sang songs for Suchitra Sen both in the Bengali films as well as the bollywood films. As Suchitra Sen’s hindi films were restricted to only Devdas, Champakali, Musafir, Bombai Ka Babu, Mamta, Aandhi, etc, Geeta Dutt got a limited scope of contributing in Suchitra Sen’s hindi films. Even then, the songs are still remembered by many generations and for those reasons the films should also be preserved. It is a pity that Suchitra Sen had gone behind the purdah. The media people cannot approach her to get interview. The films of Suchitra Sen should be preserved and restored.